How Do You Spell BRICKS? 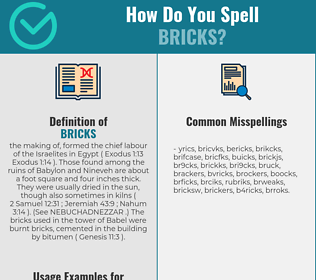 Correct spelling for the English word "BRICKS" is [b_ɹ_ˈɪ_k_s], [bɹˈɪks], [bɹˈɪks]] (IPA phonetic alphabet). Below is the list of 216 misspellings for the word "bricks". the making of, formed the chief labour of the Israelites in Egypt ( Exodus 1:13 Exodus 1:14 ). Those found among the ruins of Babylon and Nineveh are about a foot square and four inches thick. They were usually dried in the sun, though also sometimes in kilns ( 2 Samuel 12:31 ; Jeremiah 43:9 ; Nahum 3:14 ). (See NEBUCHADNEZZAR .) The bricks used in the tower of Babel were burnt bricks, cemented in the building by bitumen ( Genesis 11:3 ).